Psalm 51:12 Restore to me the joy of your salvation, and make me willing to obey you. Remember that day when you made Jesus the Lord of your life? Something good overwhelmed you and started growing inside of you. Your countenance changed. You began to see people differently, react differently and even the words coming out of your mouth were different. You found the JOY of the Lord! Now life has continued, challenges have come and some painful seasons have overshadowed that "joy-full" experience. You find yourself tired of trying, sometimes going so far as to isolate yourself from others. You may even feel like no one understands. David had moments just like that too. You can read about his in the psalms. In Psalm 51, out of the darkness of isolation and within the grip of fear and pain, he prayed a simple prayer: Lord, give me the joy back. Help me to continue being willing to trust you and follow you even when I feel like this. It was then that God delivered David. And the good news is that he will deliver you too! Joy can come back. This could be your day! Ask God to restore to you the joy that you had when you first asked Him to live through your life. That joy will strengthen you with a willingness to keep doing the things He teaches you. 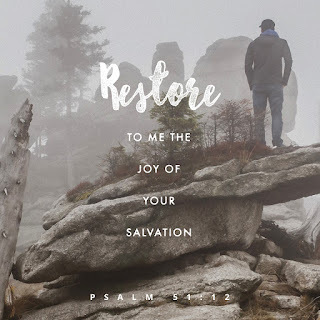 Lord, give me my joy back!